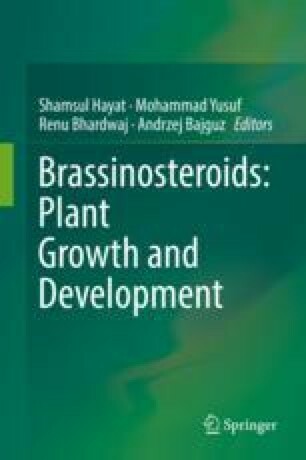 Biologically active brassinosteroids (BRs) induce a broad spectrum of responses, including stimulation of longitudinal growth of tissues via cell elongation and division, besides stimulation of vascular differentiation, the last one a developmental process critical for shoot elongation. We have been using in vitro-grown plants, especially the marubakaido apple rootstock, as test systems to probe into the ability of BRs, mainly new synthetic analogs, to control shooting. Replacement of 5α-H or 3α-OH groups of the steroidal structure of BRs by 5α-F, 3α-F or 5α-OH groups, respectively, has led to significant changes in the abilities of parent compounds such as homocastasterone to control shoot formation and their further elongation, being the effect species and organ-specific, besides being also dependent on the type, i.e., hydroxy or fluoro, position of the substitution. In this chapter, it will also be discussed how treatment of in vitro-grown shoots with new synthetic BR analogs has helped to: (1) Enhance our understanding about the relevance of selected functional groups for the BRs’s action mechanism(s); (2) Get an insight into the morphological responses of shoots, grown in vitro, to the application of BRs and synthetic analogs; (3) Improve micropropagation techniques for clonal propagation, especially of woody species, in which new shoot formation and its further elongation is typically a constrain for efficient micropropagation; (4) Guide the development of novel BR analogs for higher activity, at a lower cost.